Andalucia covers 17.3% of Spanish territory making it the largest single region, with an area greater than countries such as Belgium, Holland, Denmark, Austria and Switzerland. In Andalucia, contrasts are the norm. The diversity of the landscapes which make up the region provides an entire spectrum: from the warm Guadalquivir valley, to leafy low mountain areas, from volcanic landscapes such as the Tabernas Desert to the white peaks of Sierra Nevada. The Marbella area has 27 Km. of coastline which is divided into 24 beaches. 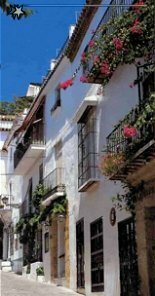 The nearest airport to San Pedro del Alcantara is called 'Pablo Ru�z Picasso', and it is situated 8 km southwest of Malaga. You will find lots of them at the gate to Malaga Airport. The airport taxis will take you anywhere along the Costa del Sol and the rates are fixed and the current tariff should be available in the taxi. The price of the trip Malaga Airport to Marbella is about 45 Euros, to Puerto Banus 48 Euros, or to Estepona 60 Euros.